Do you know someone who hurts themselves? Are you at a loss as to how to try and do the right thing by them. Is it ok to talk about it, or should you stay quiet? Is it ok to ask to see cuts, burns or scars? How you react to someone’s self injury (SI) is important, and how they react to your concern may well distress you, but each individual deals with their self harm in their own way. 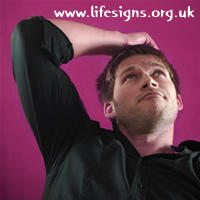 When you first find out that a loved one self injures you may well feel overwhelmed with conflicting emotions. Perhaps you are shocked that your loved one resorts to self harm, perhaps you are confused as to what it all means. You may experience guilt and anger, frustration and sadness. Depending on how you discovered your loved one relies on self harm as a coping mechanism, you may have little time to adapt to the news. Self injury is a very personal act, and there are many methods by which a person hurts themselves. It can be best to ignore the method of self harm to begin with, and focus on the emotional experience that you’re loved one is going through. 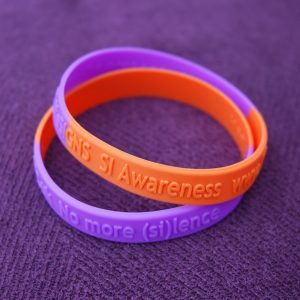 Self injury is a word which covers a lot of behaviours, all of which share one key element; they are done with the intention of harming oneself, but not as a way to commit suicide, rather, as a way to cope and survive. It can be frustrating supporting a loved one through self injury as they may not feel comfortable to talk about what drives them to harm themselves, yet they may also feel very lonely and isolated, feeling trapped in their emotions. It’s important to look after your own emotional well being if you are supporting someone who uses self injury. It can be tempting to issue a demand or ultimatum, saying that they must stop hurting themselves this instance. It’s tempting to believe that everything will be alright now that you know, and now that you’re helping. Such ultimatums can only serve to drive your loved one further away from you, as you demonstrate that you don’t understand and that you’re not listening. A person who self injures may well feel isolated and alone; ultimatums only increase the feelings of isolation. At times, even professional caregivers such as Counsellors will insist that a person agrees to a ‘No-Harm Contract’. This can only be counter-productive. As self injury is a coping mechanism it is not reasonable to take it away before providing a suitable replacement mechanism, or strategy for coping. 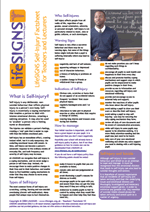 The FirstSigns fact sheets for Family/Friends give general information which will be useful for anyone who knows someone who self-injures. The following information elaborates slightly, depending on your relationship with the person. 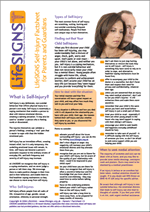 Finding out that your child has been self-injuring might come as a total shock, and can be devastating. A person who self-injures often thinks that by taking out their emotional pain on themselves that they won’t be hurting other people. Of course their self-injury will hurt those who care about them, but you must remember that this was not their initial intention. Depending on the age of your child it can be hard not to panic, but you must try not to. Be there if your child wants to talk, and do not belittle them when they do. Remember that self-injury is habit-forming, and once someone is in the cycle of self-injury the smallest things might trigger them. Telling your child that it is stupid to hurt themselves because they have had an argument with a friend or because they have failed a test is not going to achieve anything, and will only upset you both. Although it is difficult you must try to give your child space and privacy. Encourage them to talk, and to accept professional help, but don’t force them. Obviously you want your child to stop hurting themselves, but this can be a long process. No one (especially young people) likes being told what to do and what not to do, so telling someone to stop is not helpful. Remember to let your child know that while you do not condone their behaviour, you love them unconditionally and will always support them. Completely revised, reviewed and updated; specifically written for parents and guardians of teenagers and children of any age who self-harm. Useful for children to print off for their parents, and useful for parents to get an insight into their child’s behaviour. If you’re a friend of someone who is under 18 and self-injures, encourage them to speak to an adult about it. If you are at school there might be a nurse or counsellor, or a trusted teacher who you they could talk to. Or you might offer to be with them if they feel able to talk to their parents or another relative. Your friend might tell you that you must not tell anyone. However, if you’re concerned that they are in danger or might be suicidal, then you have to tell someone. Remind your friend that while telling people isn’t easy, in the long-run it will enable them to get the help they need in order to start feeling better. As a friend of someone who self-injures (of any age) be there to listen to them. Try to remain calm and patient even if you can’t understand why they would want to hurt themselves. Let your friend know that they are not alone, and encourage them to join the FirstSigns message board for peer support. Above all, although you care about your friend you must remember to take care of yourself first. Unless you do this you will not be a help to anyone! Friends can offer so much support to each other, and people often talk to their friends before they talk to parents or doctors. 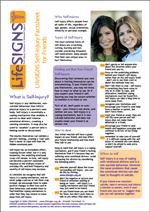 If you have a friend who self-harms, print off this factsheet for yourself, and maybe share it with them. Having a relationship with a person who self-injures can at times be frustrating and very upsetting. Your partner might have been self-injuring long before they met you and you might think that now they have you that they shouldn’t feel the need to hurt themselves anymore. However, self-injury is a complex behaviour, and no matter how much you would like your partner to stop hurting themselves, it is not that simple. Encourage your partner to seek professional help (if they have not done so already) – counselling as a couple might be appropriate for you. Be there for them through the highs and the lows, but make sure that you look after yourself as well. 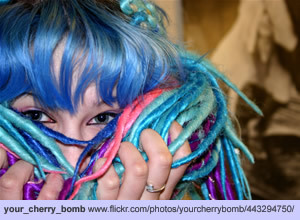 Self injury isn’t confined to teenagers, people of all ages can be afflicted by the syndrome of self injury. If you discover that your parent hurts themselves, it might be something they’ve done for a great many years, so try not to be overly shocked. Your parent may well have a good understanding of their destructive behaviour. Parents often feel the need to protect their children from the difficulties of life, and your parent may not feel comfortable talking to you about their emotional distress and mental anguish. You can support your parent as they seek help, you can encourage them to speak with Doctors and Counsellors and Psychologists. Just because your parent may wish to see a Psychologist doesn’t mean that they are ‘mad’ or ‘crazy’; everyone experiences mental distress at some time in their life, and it’s best to seek support, in time, the distress can be minimised, and new ways of coping can be learned. 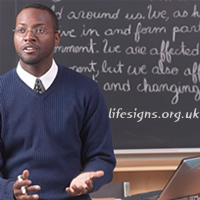 FirstSigns offers training for schools, colleges and universities, please read more about our training seminars. Completely revised, reviewed and updated; specifically written for teachers and lecturers and professionals within the educational system. Self-injury in school aged children and young people is a very real issue that all schools, colleges and universities need to take seriously. 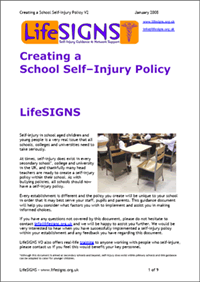 As with bullying policies, all schools should now have a self-injury policy. Every establishment is different and the policy you create will be unique to your school in order that it may best serve your staff, pupils and parents. This guidance document will help you consider what factors you wish to implement and assist you in making informed choices. 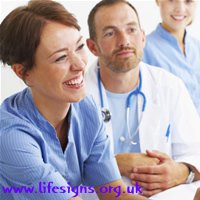 FirstSigns offers training for health professionals and is ofter relied upon by the NHS; please read more about our training seminars. 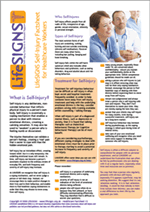 Completely revised, reviewed and updated; specifically written for healthcare professionals and practitioners, the ‘Healthcare Worker’ factsheet is practical introduction to self-injury and the treatment and care of people who self-harm. FirstSigns offers training for the NUS, Nightline and Welfare, please read more about our training seminars. Discuss this article on the FirstSigns Message Board now (no login required, but you may wish to Register first).